If you’ve ever watched a snake at the zoo and thought he looked menacing because of his unblinking stare, you could have been watching him having a snooze. In your mind you may have decided he was trying to hypnotize you, but the reality is that snakes sleep with their eyes open. If they are not moving, it is difficult to tell whether snakes are awake or asleep. Snakes have no eyelids, so they can never close their eyes or blink. Instead of eyelids, thin clear membrane cover their corneas, called spectacles or brilles. These are attached to their skin. Although they can not close their eyes, they can close the retinas when they are sleeping. Some snakes have round pupils, like humans, while others such as pit vipers have vertical-slit pupils. Snakes for the most part live close to the ground. They get dust, grit and bits of vegetation in their faces as they move through their natural habitats. The spectacles protect the sensitive corneas from scratches and damage. The thin membranes do not lie directly on the corneas but are separated by thin layers of fluid or tearlike secretions that moisten the eyes. Scientists are studying snake eyes to develop better contact lenses. All reptiles produce tears. The fluid between the retinas and the spectacles is produced by tear glands behind the lenses. A pair of nasolacrimal ducts drain the fluid into spaces in the roof of the mouth. Because the spectacles are attached to the skin, the tears cannot overflow from their eyelids as they do in mammals. This is why snakes cannot cry. Because the eye scales are part of the skin, they shed with the skin. 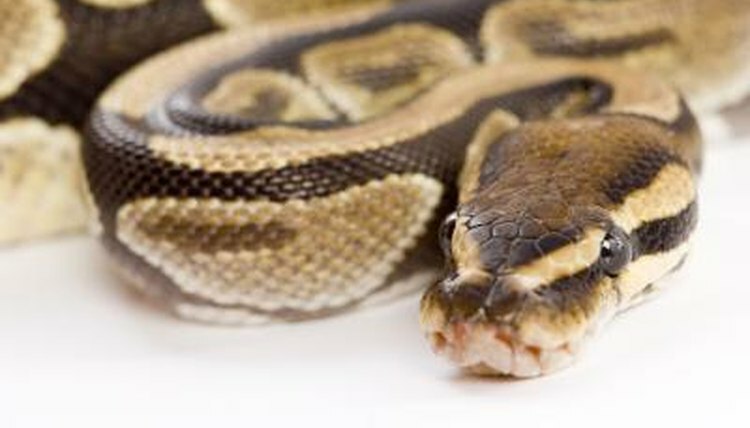 Mature snakes shed once or twice a year, while younger growing snakes shed up to four times a year. Prior to shedding, snakes' eyes become opaque and milky-looking as the snakes secrete a milky fluid between the old skin and the new skin to aid shedding. The snakes rub their mouths against something to split the old skin, then they peel it back like pulling off a sock inside-out. The old skin is colorless; the eye scales are clearly visible. Museum Victoria: Do Snakes Ever Blink?